Well, I have not been blogging much as it is summer and I have been out riding, running and gardening, not to mention work and all the other business of life. 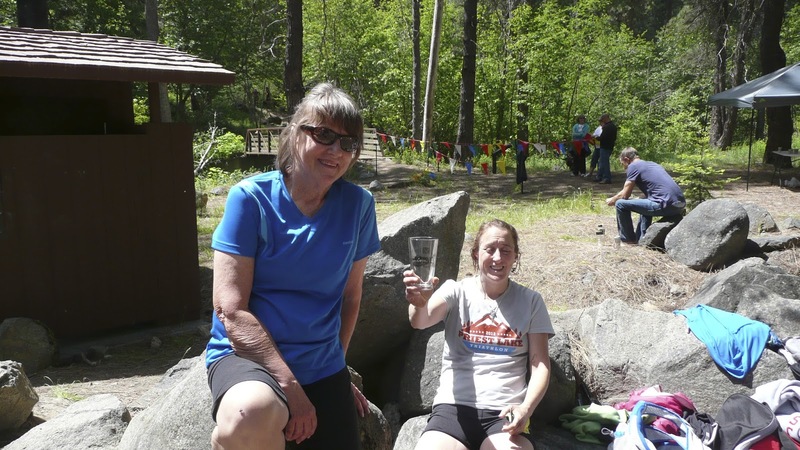 I did want to do a post on the Red Devil Trail Run, even though it was back in June. 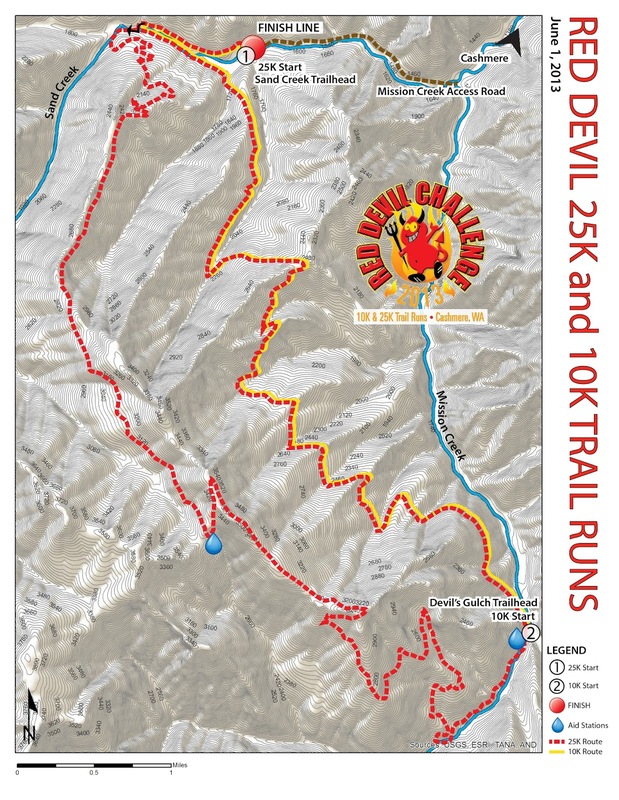 Anyone who is also a runner out there might really enjoy the Red Devil, just outside of Cashmere. This year they added the option of a 10K or a 1.5K kids run to the 25K. Map of the race... A great trail run just for fun too! My sister and I did the 25K again, but we were most proud of the fact that we talked my mom into starting running. I can't ever remember her going out for a run and prior to this year she had never entered a race. We did a lot of fast talking and got her signed up and trained up. She completed the 10K run in 1:36:10. In addition to meeting her goals of finishing in less than 2 hours and not coming in last place she managed to lose 15 lbs and counting by running it off. Over all she feels better and has more energy, and all of this at the age of 65! She just proved that it is never too late to start! 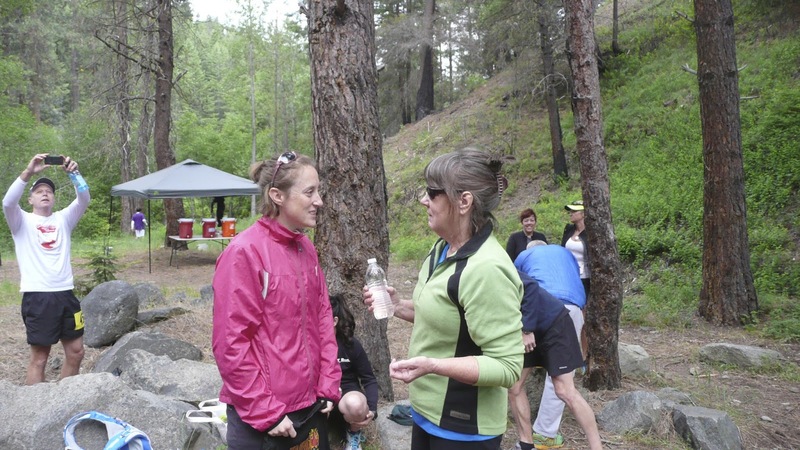 Charlene and Mom discussing last minute strategy before the race. I competed in the 25K again this year. I was a bit disappointed at being slower than last year, but I learned a bit about race strategy and will be better prepared next time. My first excuse or failure was in training. I have been focused on biking this year and have not been running enough. I did go out and run the course and did some long runs but I hate speed work and so did not do much (well any speed work really). In addition I made some mistakes on race day. I think I did not eat enough prior to the race, breakfast was a good 2 hours before and I skipped the free snacks at the start. 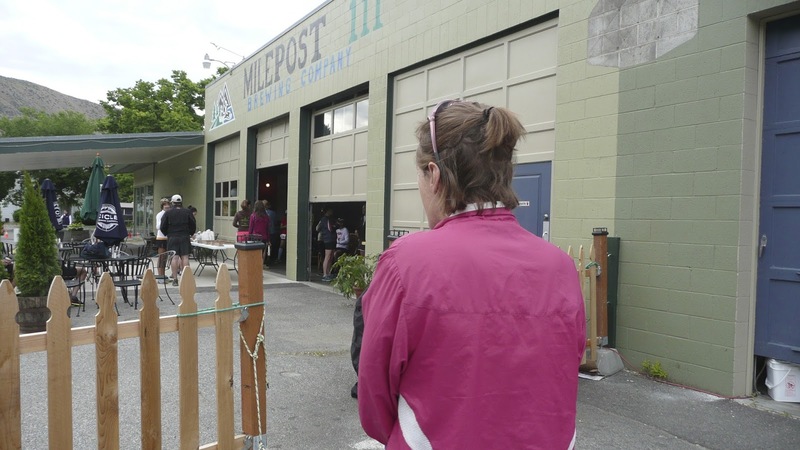 Charlene at MilePost 111 the meet up place for the race. Note the goodies that I did not eat. I then started out way too fast chasing some people uphill. I was trying to keep up and just burned out all of my energy too early. I missed the first aid station and so was running out of water and calories by the time I made it to the 2nd. Too late!! I felt nauseated and bonkish on the last section of the race. I did learn how to push through and was quite proud of my 8th place (for women) finish, and hope to move up next time. All in all it was a great race and we had fun and a well deserved post race beer at Milepost 111 in our Red Devil pint glasses. I confess that the photos are not up to the usual standard but that is because Josh was not there. He is the family photographer, and I was gasping for air and so did not take any photos of the trail.